The current reading material is a novel loaned to me by Christopher’s father Paul. Vindication is a novelized telling of the great feminist writer Mary Wollstonecraft‘s life. Paul recently read this novel for his book group. He has a very good sense of what I enjoy reading and asked if I’d like to borrow it after the book group review night. It’s a good but quite dark book thus far. Right up my alley – realistic portrayal of women’s lives. While I’m not a well educated woman (a college drop-out who simply wasn’t prepared for college at the high school I attended) as Chris has noted, I am fairly well read. I usually roll my eyes when he says this but I’m starting to feel much better about the compliment (and it’s woefully difficult for me to believe compliments since I know most are just lip service). Several times the author, Frances Sherwood, has referred to other novels, classics, usually during dialogue. Mary Wollstonecraft (the fictional character) laments at one point of becoming like Moll Flanders, and I immediately knew the reference to the book and the meaning of her fear. I love when that happens. During breakfast this morning I decided that while I have several novels lined up in my queue that I refused to postpone, I would very much like to make 2010 my year for the classics. What suggestions do you, Dear Readers, have for me? Classic fiction – classic non-fiction – biographies of historical figures (particularly writers and artists) – I’m open. Don’t be shy – list your recommendations in the comment section below – and thank you! Clear Creek Lavender is once again headed south to Memphis and the Pink Palace Festival. Earlier this evening I reread a post written while we were in Memphis last year. While I haven’t practiced or perfected my southern drawl in the past year I am delighted to be going back to Memphis where being polite is natural and even the barbs are sugar-coated. I asked Christopher tonight at dinner where we’d had the great ribs and since his memory for names is much better than mine he immediately said “Corky’s”. MMmmm Corky’s dry rub bar-b-que! Remember that post by me about casting on Shipwreck with my hand-dyed llama yarn? It wasn’t meant to be. I frogged the llama yarn and put it back the side of my desk. Llama yarn just doesn’t have the right elasticity for that project. I loved the yarn (from a dear friend’s llama) and loved the color. But while I’m waiting for the silk to arrive I needed (yes needed) something to work on. Socks weren’t doing it for me. After a few rounds late one night they went back into the designated sock bag. I tried swatching the llama for a cowl. Wrong project for the yarn. Again. Then after several days of no real knitting progress I had an AH HA moment! The perfect project for the llama yarn popped into my noggin and I even had the pattern, actually I had a magazine copy and a book copy of the pattern. The perfect match for the llama yarn is the Icarus Shawl! I’m halfway through the first chart and terribly smitten with the combination. When the Icarus was initially published in Interweave Knits I was a rookie knitter. I’d knitted socks and scarves but lace was tantalizing me at every turn. At a spring festival I bought a skein of lace yarn but in my ignorance didn’t realize it was not nearly enough for the project. Long story short – that initial Icarus (Icky as I called it) was frogged over a year ago. And that was a long past when it was completed. 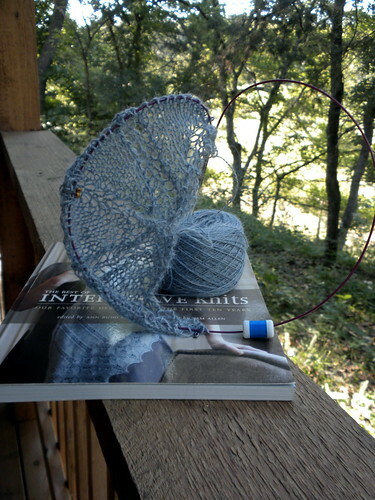 Icarus is a lovely pattern and with my much improved lace skills it is flying on the needles. I’ve bought beads that I’ll use on the final chart or two. I’m now happy to be working on my Icarus Shawl (which shall never be called by that other evil nickname). It was a very good lesson to keep in my mind, let the yarn decide the pattern. So until my Shipwreck silk arrives from across the pond I’m happily committed to my new improved Clear Skies Icarus! Last night we took a few hours off from prepping for the next few lavender events and drove into Tulsa for dinner with my daughter Hillarey and her partner Lance. Actually one of the bands Lance plays in was the evening’s feature entertainment at one of our favorite eateries, Elote in downtown Tulsa. Lance is one of those wildly talented musicians who plays by ear and can play any string or percussion instrument you hand him. Last night’s band was Jirraff (I think I got that right!) – an acronym for jazz-improv-and-reggae-rock-funk-fusion. Lance is also the lead guitarist for Sam and the Stylees, an award winning local reggae band. Fantastic music! I’m constantly impressed by the music Lance and his buddies create! It was also hoop-for-half-priced-entrees night Elote. Now who can pass up a chance to hula hoop for dinner? Not us! Hillarey and I both hooped our hearts out along with many of the other people in attendance. 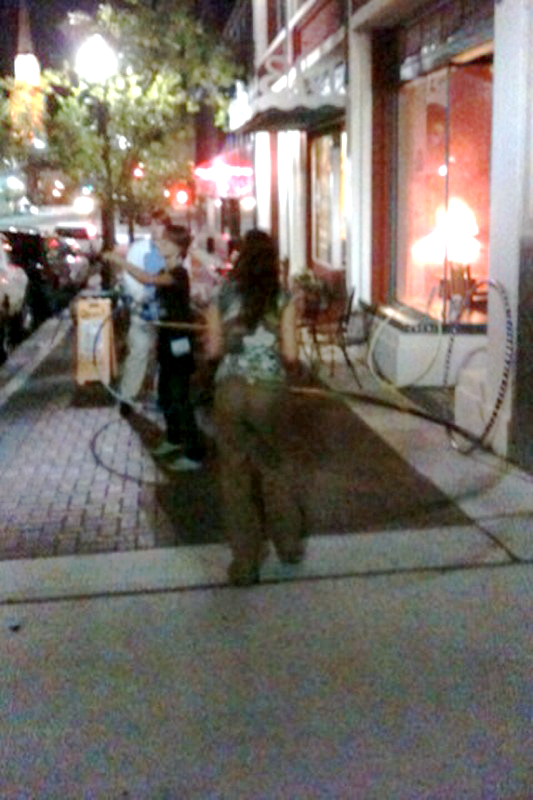 (I’m in the white shirt, the other photos are of Hillarey) Even Libby the owner was hooping out on the sidewalk and street. 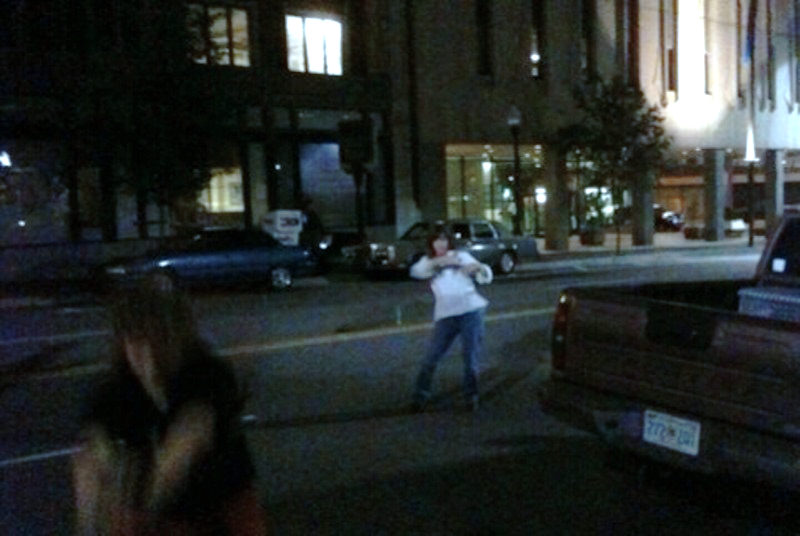 I’m sure that people driving through a quiet Tuesday night in downtown Tulsa were surprised when they turned onto Boston Avenue and encountered people having a grand time hooping up a storm!! Sometimes it is the little luxuries that make me happy. 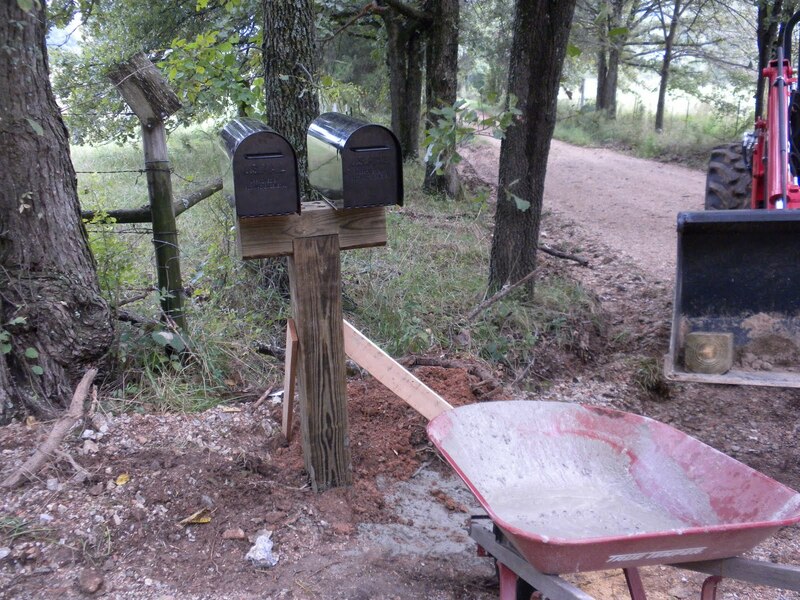 Like having mailboxes again after six months. They made it through the weekend without being demolished. I’m feeling pretty optimistic. My blue phase continues with the Shipwreck Shawl , but my Shipwreck will take place in a clear blue sky with lush llama yarn! This yarn is from my friend Lisa‘s llama “Ally”. Ally is actually a cream colored gal but I’ve been playing in the dye pot and like the results. 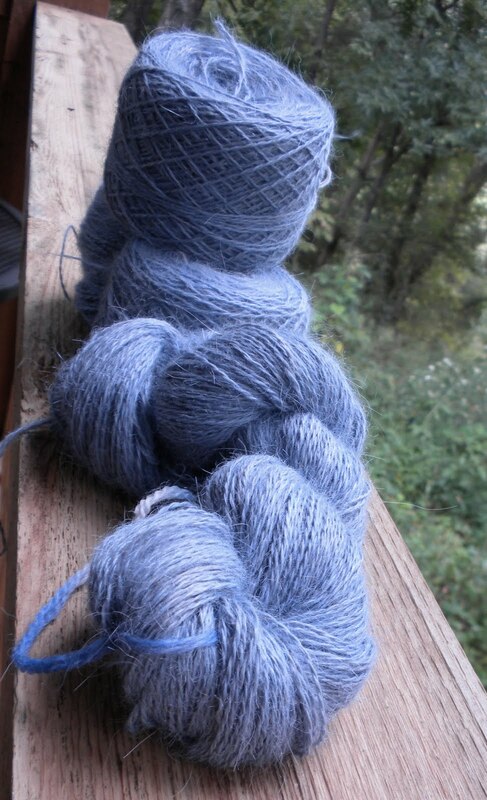 Llama yarn is similar to alpaca but has more luster and less halo. It’s a dream to knit with and very warm. We’re off to Winfield, Kansas tomorrow and four days of music and fun at the Walnut Valley Festival while hoping to spread the lavender love as well. My clothes aren’t packed, the product is ready to pack, the camping gear is sorted, but my knitting bag – it’s ready! Four projects inside the bag (one never knows what the knitting mood will be), the ongoing socks, a test knit for a friend, barely cast on Almeara gloves, and the as yet begun Shipwreck Shawl.